This year I did a 14 day countdown to Valentine's Day. Each night I presented my husband with a poem and a gift. In a food processor with a metal blade, process the sugar and coffee powder until the texture of the sugar becomes very fine. In a large mixing bowl, beat the egg whites and vanilla extract with an electric mixer at medium speed, until very frothy. Add cream of tartar, and continue beating at medium speed until soft peaks form. Increase beater speed to high, and gradually beat in sugar-coffee mixture. Continue beating until soft peaks form and mixture has a glossy sheen. Drop by tablespoonfuls onto prepared cookie sheet, leaving 2″ between cookies. Bake for 1 hour without opening oven door. Turn off oven, and let meringues dry in oven 2-3 hours more without opening oven door. At this point you can leave them in the oven overnight. Remove the meringues from the cookie sheet with a spatula. Store in airtight container. I made these for our special dinner. They were definitely delicious. Preheat oven to 375 F. Coat a shallow baking pan with cooking spray. In a medium bowl, combine crabmeat, sour cream, bread crumbs and roasted red peppers. Mix gently to combine, being careful not to break up the crab. Spoon crab mixture into halved poblano peppers and arrange side by side in pan. Top mixture with Parmesan cheese. Cover pan with foil and bake 20 minutes. Remove foil and bake 15 more minutes, until peppers are soft and cheese begins to brown. For dessert I served layered pudding parfaits. I used cheesecake and chocolate flavors of instant pudding. I used fat-free half and half instead of milk. I like the way it puffs up the pudding mix. After dinner we played a silly Valentine's day board game that I found at Target. I baked pink sugar cookies for my daughter's classmates. through, drain off excess fat. until a knife inserted near center comes out clean. Cut into squares. Serve with salsa, if desired. with pancake turner and slide onto wire rack to cool. Bake and cool second tree. Pour milk into large bowl. Add dry pudding mixes. Beat with wire whisk 2 min. or until well blended. Let stand 5 min. Gently stir in 3 cups of the whipped topping and half of the cookie crumbs. Spread evenly into 13x9-inch baking dish; sprinkle with the remaining cookie crumbs. Refrigerate at least 1 hour. 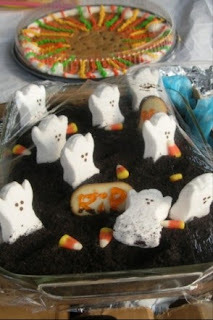 Decorate creme sandwich cookies with decorating gel to resemble tombstones. Set aside until ready to use. 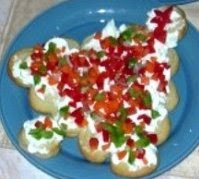 Insert decorated cookies into top of dessert just before serving. Add candies. Drop large spoonfuls of the remaining whipped topping onto dessert to resemble ghosts. Cover and store leftover dessert in refrigerator. (32 to 35 minutes), or until cake springs back when pushed on. 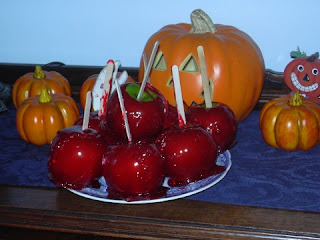 Remove cakes from oven; let cool 30 min in pans before unmolding. Flip to keep layers crumb side up. sugar with an electric mixer on high speed until stiff. plate. 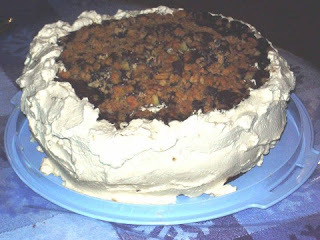 Spread half of whipped cream mixture over cake. Top with remaining cake layer, crumb side up. frost top of cake. Refrigerate until serving time. The little things in life can bring great joy. 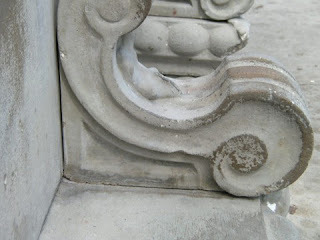 I thought I would begin this blog with a few photos of interesting details. This bench is a resting spot for me while the family rides Tower of Terror at Disney's Hollywood Studios. I haven't sat on this bench for three months. I miss it. I would rather be at a Disney park than anywhere on earth. 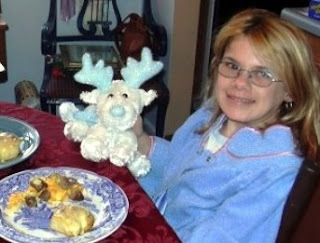 My older daughter has been a cast member since October 2006. I am very proud of her. When she was four years old, during her first WDW visit, she told us she would one day return to be a performer. Fifteen years later, she did just that.